Windows 7 introduced many new features to make it easier for consumers to use the operating system. One of these features is called Shake. Shake allows you to actually shake your way to the desktop. Some of us have a multitude of programs open at once, maybe a few documents and gosh knows what else cluttering the desktop. If we want to get to the desktop in a hurry, you may have to close every single window open to get there. If you have a lot of windows open, this can be time-consuming and even annoying. Using the Shake feature can get you to the desktop instantly when keeping the required window open. If you have Windows Home Premium, Enterprise, Professional or Ultimate, you can begin using Shake as soon as your operating system loads. Open up a variety of applications, documents, and windows to clutter your desktop. Left click the window bar for an application or document. 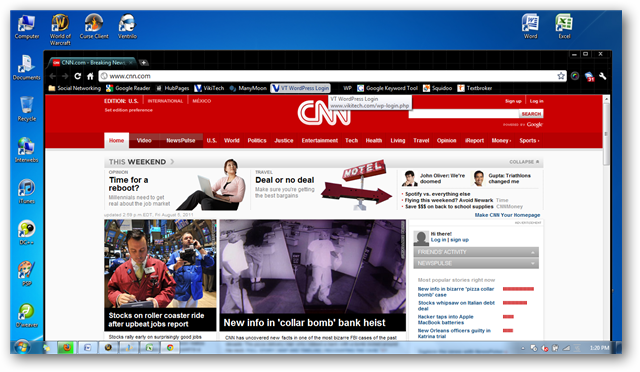 For this example, I will left click Google Chrome. Now, shake it side to side. One-by-one, your documents, applications and open windows will minimize and you will be left staring at your desktop and the window you grabbed hold of. If you want to return your windows, documents, and applications to where they were, simply grab hold of the window again and shake some more. This will maximize everything the way it was. If Shake does not seem to do it for you, you can also minimize all windows by holding onto your keyboard’s Windows logo key and the Home button. This will minimize everything for you. You can click the same two again and this will maximize your windows again. It should be noted that not all windows can be minimized using Shake. Important Windows dialogs, security warnings, and various pop-ups cannot be minimized because they are meant to be read and taken care of when they show up. If you have the Show Desktop button located on your taskbar, you may not ever need to use Shake and this can be an alternative to using it if you do not have a version of Windows 7 that offers it. Does the Shake feature make a difference? 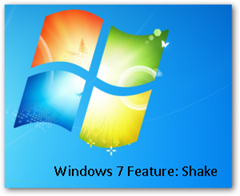 Depending on how comfortable the Shake motion is for you, you may or may not find it a useful or functional feature in Windows 7. If you are still using the Show Desktop feature from Windows XP, you may find it more convenient to just press that on your taskbar than shake a window until you reach the desktop. Shake can be an exciting way to clear the way to your desktop, but it may not be a feature that appeals to the majority of Windows 7 users. Give it a try yourself and see if it feels right for you.